Like most professional guitarists Raymond has performed on instruments by a variety of makers, these include Masaru Kohno, David Rubio, Nico van der Waals, Paul Fischer, José Romanillos, Bert Kwakkel, Martin Fleeson and Christopher Dean. 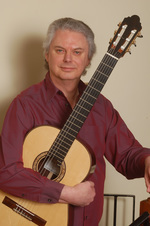 He currently plays a guitar by the English maker Philip Woodfield. "I can honestly say that my new Philip Woodfield lattice guitar comes as close to the perfect instrument as could be imagined. It has volume, is comfortable to play and the balance between bass and treble is exceptional. The guitar has rich, resonant basses and clear, ringing trebles with bags of sustain. I will be using it for all my future concerts and recordings. It's a fine instrument." 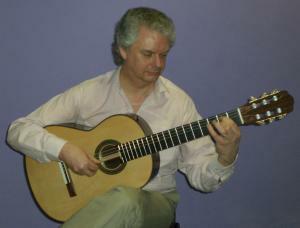 Raymond has also played a vihuela made for him by Paul Fischer. He is currently having a five-course guitar built the Litchfield based maker Roger Williams. Gary Nava is a maker that has produced a wide variety of stringed instruments including classical guitar, steel strung guitar, mandolin, mandocello and cittern. Raymond has spent a fair amount of time playing one of the classical guitars and says of it: 'Gary Nava's classical guitars are beautifully made, responsive and with a well balanced sound. They are realistically priced and compare very favourably with much more expensive instruments'. Raymond has just recieved a new guitar from the Sussex based maker Philip Woodfield. 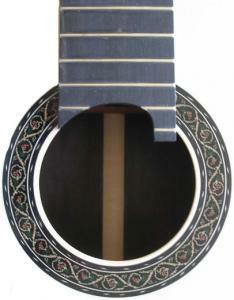 It's a beautifully made lattice-braced guitar with the name 'Kiri' - after the Australian soprano Dame Kiri de Kanawa. 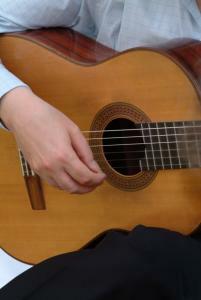 After just two days playing the guitar is very powerful, beautifully balanced and very open. Who knows what it will be like when it's fully played in! Raymond recommends Miles Roberts' Kent Guitar Classics for all guitar needs: guitars, guitar cases, strings and accessories.